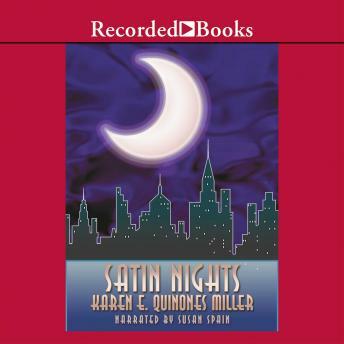 Karen E. Quinones Miller pens sizzling tales of passion and intrigue. Her books, including Using What You Got, have appeared on Essence and Blackboard best-seller lists. Thirty-something writer Regina lives in Harlem with her four-year-old daughter. And no matter what she does, drama follows her wherever she goes. Her world is thrown for a loop when shady Little Joe re-enters her life looking for some action. Unfortunately, her lingering feelings for her Congressman ex-husband aren't helping either. But Regina's not the only one with issues. Her best friends Tamika, Yvonne and Puddin' are all dealing with no-account men of their own. Drawing strength from one another, these four women keep it real on the streets of New York City. Sassy and endearing, the spirited women of Satin Nights stick together through thick and thin.